SB138 (Collector Steven Brack) Las Cruces, Dona Ana County, New Mexico, USA. Juvenile specimen. Altitude range: Around 1850 metres above sea level. 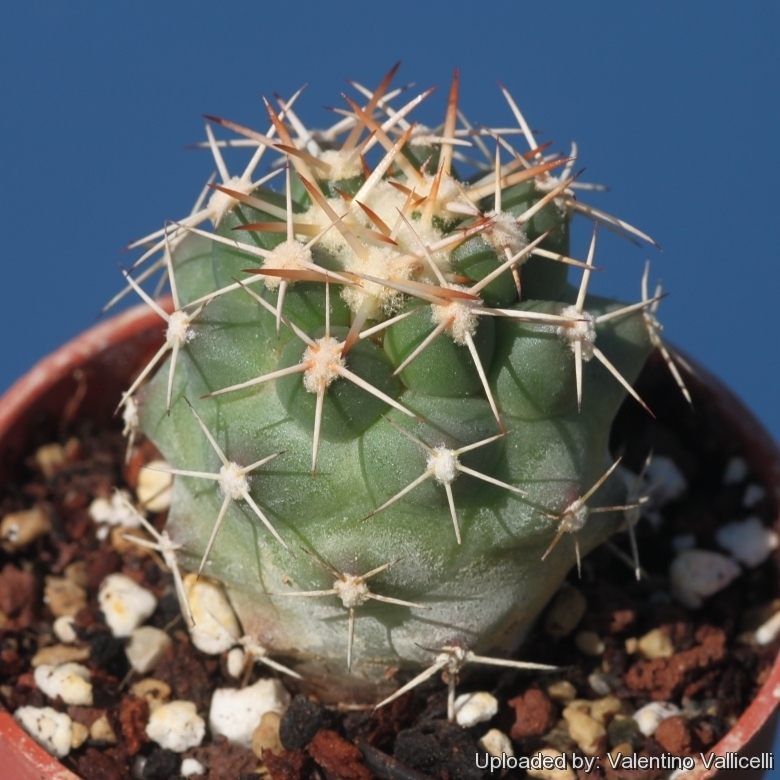 Description: Coryphantha scheeri v. valida is the New Mexican form of the widespread Coryphantha robustispina subs. scheeri (= Mammillaria scheeri Mühlenpfordt 1845). The var. valida was firstly described as Mammillaria scheeri var. valida by Engelmann in 1856 without having seen Mammillaria scheeri Mühlenpfordt. Engelmann had presumed that his var. valida might be just a somewhat larger and more heavily spined northern form of Mammillaria scheeri (from Chihuahua in northern Mexico). When visiting the collection of Prince Salm-Dyck, he found original plants of Mammillaria scheeri which corresponded completely with his var. valida, thus confirming his initial assumption. As Engelmann himself had realised already, var. valida does not contain enough distinct criteria to delineate a variety or subspecies and it should be fully synonymized with Mammillaria scheeri (Coryphantha robustispina subs. scheeri).